I'm doing my first live improvised visual performance with Jeff Younger and some amazing dancers and performers tomorrow night at the Orpheum Annex! I'll be playing with video from Ukraine, with live animation, and VJ-type live cams. I feel like someone has taken a DJ and said "here's a guitar!" which is pretty fun but also terrifying. Come see me triumph or crash! It will be a great event! Come to the spectacular performance of SPACE, BABY. Space, Baby is a multimedia performance inspired by the palate of 1960s sci-fi film which tells the surreal story of a lone woman searching her galactic memories in an effort to escape the realities of an ever-approaching future. The woman is a rogue astronaut witnessing her own past. She plays multiple versions of herself as seen through the lens of her changing memories. Using a forcefield of sound and imagery, the camp-aesthetic of films such as Barbarella, and the genre-bending of American Astronaut, Space, Baby is a multimedia performance about regret and forgetting. Live Music Playlist from St John’s Newfoundland! One of my missions in St John's was to record as much live music as possible, for sharing with my friends and colleagues and for possible use in a future video installation / exhibition. After two visits to Newfoundland over the decades, the amount of live music was what stuck with me the most. Like, without leaving downtown, I shot 9 bands in a week and a half. This was a residency with Catherine Falkner at the Black Bag Media Collective. Thanks to the Canada Council for the Arts and Liz Solo. Shot this as part of a residency in St John's, Newfoundland, with Catherine Falkner at Black Bag Media Collective. Box from Flick Harrison on Vimeo. I've just polished up the multimedia projections on this new dance work for Dancers Dancing. I've been working with Judith Garay for years as a videographer and now as a projections designer. For this show I've been using Isadora with Osculator, to allow Wii controllers in the dancers' costumes to affect the projections. I've played with a little animation, and I have an infrared camera doing a some motion detection. It will be an awesome experiment for me and the dance, music, costumes and lighting are beautiful. Performed by Cai Glover, Vanessa Goodman and Bevin Poole of Dancers Dancing. A PERFORMANCE TALK BALK WILL BE HELD AFTER THE SHOW ON THURSDAY, MAY 24TH. The Fine Line ~ twisted angels explores in movement, sound and image how we experience, perceive, relate to and react to our internal and external worlds. Ephemeral, sometimes transformative, the moments between perceiving, sensing and cognition create a rich tapestry of somatic images. The work engages with the fragility of our existence and risks the deep and dark journeys necessary to project the internal experience directly onto the stage. 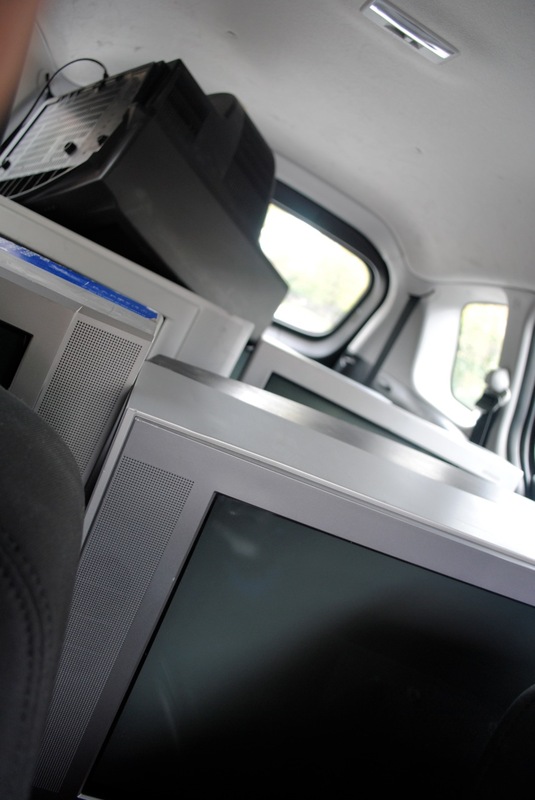 Imagine if, ten years ago, you could drive around collecting free, working televisions until you filled several carloads, then finally had to abandon dozens more because you had no room. That's where we're at today, as the dominant technology of our living room becomes obsolete practically overnight. HDTV is sending those heavy, awkward boxes out to the curb, to be replaced with newer, more expensive, and quicker-to-obsolescence machines. I'm designing media for a new theatre show - Macbeth: nach Shakespeare by Heiner Muller. I'm building a throne of televisions that will show piles of corpses whenever the King sits on it... I thought it might be easy to gather free TV's through craigslist, but I never imagined how quickly the cathode-ray sets were being discarded. This class-warfare Macbeth takes the moral clarity out of the story: Instead of Macbeth murdering a wonderful King out of pure bloody ambition, we start the play with Macbeth committing murders for the King's benefit. Peasants strung up for not paying rent, rebellious lords skinned alive for disloyalty. So when Macbeth decides to murder up instead of murdering down, the moral leap isn't that big: what's one more dead body on the pile? Yet another evening of artistic blind dates, yet another promo clip I produced for the Tomorrow Collective. This is a sample of live documentation, which is shot as a safe wideshot to ensure the artists get all the choreography, setting, etc for posterity. 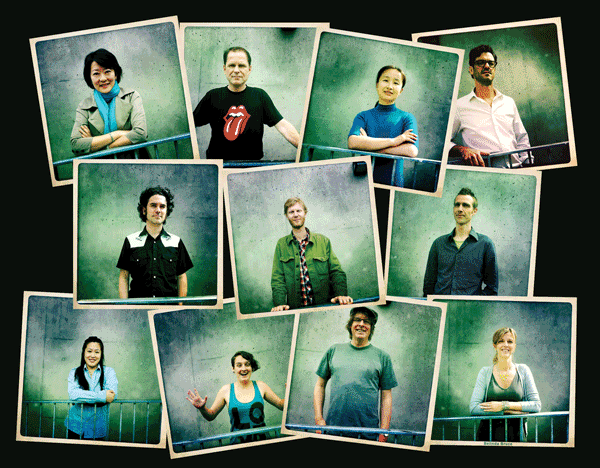 Brief Encounters is an interdisciplinary art event that throws different artists together to make short performances. They go from total strangers to presenting a work in two weeks.